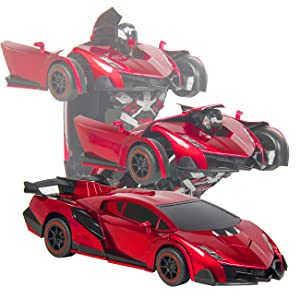 Shape-shift RC transformer robot can switch from being a red sports car to a robot! With the push of a button, this fighting robot turns into an entirely new toy. Each form features cool flashing lights and an awesome paint job. With more ways to play, this toy will keep young kids occupied for hours. Zoom and race around the battlefield in either form. Chase after enemies and battle for justice. 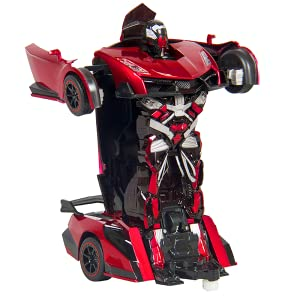 This transforming bot boasts 360° speed drifting action and exciting engine and acceleration sound effects. Grab the controller and your robot will get ready to rumble. 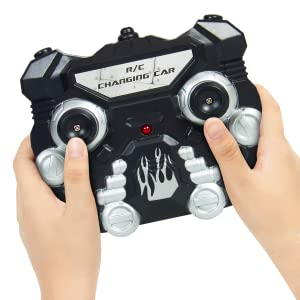 With just a press of a button on the remote this toy will transform before your eyes, ready to run around and fight at your command.